Laminates documents up to 13 inches wide. 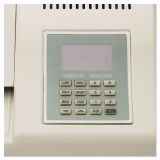 Variable temperature settings and speeds (up to 25 inches per minute). GBC HeatSeal H600 Pro Laminator, 13" Wide, 10 Mil Maximum Document Thickness - Do you need a laminating machine that works efficiently and produces high-quality, professional results? Are you frustrated by expensive machines that leave bubbles in your lamination and ruin your photos? Are you on a budget at your business and are spending too much money on professional laminating services? If you answer "yes" to any of these important questions, then you may want to look into investing in a laminating machine for your business. Try out the GBC HeatSeal H600pro 13" Pouch Laminator. 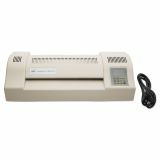 This expert, efficient laminator is a good investment for any business that does regular laminating of office documents for office protocol guides, machine equipment instruction booklets, human resources guides, and other booklets that have pages you want to last for many, many years. 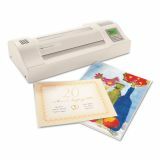 The GBC HeatSeal H600pro 13" Pouch Laminator will laminate pages up to 13 inches wide. Your pages will slip easily into pouches that then are run through the laminator. What comes out on the other side are slick, smooth, shiny laminated pages without any air bubbles and with a professional, photo-safe finish. You will be impressed by all this little machine can do. At only 38 pounds, the GBC HeatSeal H600pro 13" Pouch Laminator is compact and can be packed for lamination while on business travel, at conferences, or at trade shows. 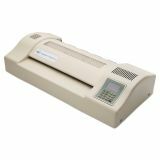 The GBC HeatSeal H600pro 13" Pouch Laminator is heavy-duty laminator with an expert, professional four-roller system that helps to bring about smooth, finished results for every page. You can use mounting board pouches that range from 1.5 to 10 millimeters with this laminating system. Get quick, finished results with the help of the GBC Heatseal Pro's 6-speed settings. When you are doing a lot of laminating, the machine will adjust using its internal cooling fans. These fans also help to protect the motor and keep it in good working condition. The GBC HeatSeal H600pro 13" Pouch Laminator's efficient, high-tech LCD screen and one-touch keypad make setting up the machine and running it a breeze. Finally, if your work gets caught in the laminator, the machine has an easy-to-use jam-release switch so that your materials are not damaged beyond repair. If you need an efficient, high-powered, compact, heavy-duty laminator that will save your business money and give you professional results, then the GBC HeatSeal H600pro 13" Pouch Laminator is the way to go. No more sending off your most important documents to a laminating service! No more expensive bills for lamination that just doesn't deliver! No more waiting in a queue to get your work done! Instead, start laminating on your own today! The GBC HeatSeal H600pro 13" Pouch Laminator is safe for all your documents that are up to 13 inches wide -- including photos. The laminator is designed to smooth out air bubbles and to give you the professional results you need to run your business and to meet all of your lamination needs. Try out this professional, compact, efficient machine! You will be impressed! 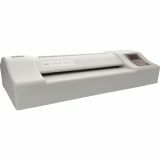 Order a GBC HeatSeal H600pro 13" Pouch Laminator today! Cold setting available for smooth lamination results with pressure sensitive pouches.